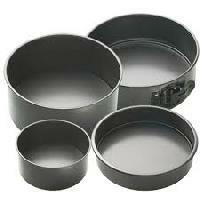 We manufacture kitchenware like cake tin. Perfect & hygenic for storing biscuits, treats & other food products. For easy storage the caketins nest inside each other when not in use.